Es ist ja schon ein Glück, dass das Thema Notizbücher im Notizbuchblog nicht ganz so eng gefasst ist. Deshalb stelle ich an dieser Stelle mal einen schönen Papiershop vor. 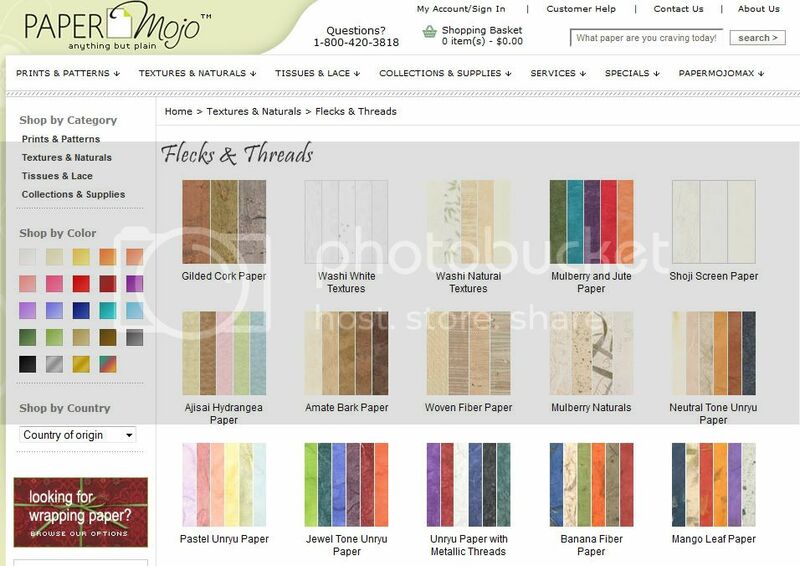 Bei Paper Mojo gibt es Papier in allen Formen, Variationen und Texturen. Für Edelfedern finden sich hochwertige Sheets, für Bastler preiswertes buntes Papier. Den Shop betreiben Shelly Gardner-Alley ihre Tochter Megan Alley seit 2003 in Amerika. Sie bezeichnen sich selbst als „papiersüchtig“, was Motivation genug war, einen eigenen Shop aufzumachen und Papier zu verkaufen. Inzwischen haben sie noch eine dritte Mitarbeiterin eingestellt, die das Team komplementiert. Although it may be perfectly obvious, Paper Mojo is owned and staffed by women who love paper … addicted really. The opening of any shipment containing new styles is guaranteed to have all our full attention and the sound of oohs and aahs. Our goal is to pass this experience on to our customers so that the arrival of each Paper Mojo order creates the same sense of satisfaction. Our mission is to provide the largest and finest decorative paper to designers, artists and paper enthusiasts, while supporting the creative processes of the paper makers. We tend to work with and sell to small businesses and individuals. In our paper line, we like to favor those suppliers who have a commitment to supporting fair trade and environmental responsibility. Paper Mojo was founded in 2003 by the mother and daughter team of Shelly Gardner-Alley and Megan Alley. Shelly’s Internet design and development experience laid the groundwork for the online presence. Over our 7 years of business, we have developed strong relationships with many of the major paper importers and stationary designers, both in the US and overseas, and we are in the unique position to have access to a vast selection of paper. Although it can be difficult deciding which papers we will stock (as true addicts, we would like to have some of everything) a significant part of our business day is often dedicated to assisting designers and business owners to obtain unusual papers beyond our immediate catalog. Presently, Paper Mojo is staffed by Shelly, Megan and Sara Joyce. Sara joined our team shortly after our move from Bucks County, Pa to Raleigh NC. She was a customer for several years when she discovered we had moved to her neck of the woods. She started stopping in to pick up her orders… and the rest is history.